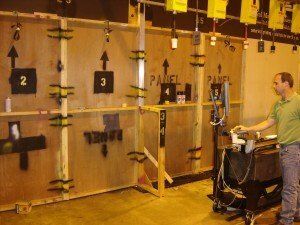 Why a Centerless Grinder Manufacturer Builds a Tradshow Booth! Tomorrow we build a tradeshow booth. Why you ask? 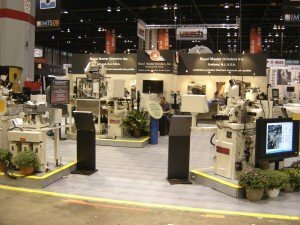 Around 5 IMTS cycles ago ( 10 Years ) Royal Master Grinders would rent a booth for IMTS. I would fly to Chicago and look at 3-4 tradeshow display companies, have a few free lunches, make polite small talk as they try to get me to spend $15,000.00 for a 40’ rental wall. Mind you this does not include graphics, and usually is an Octonorm product. Octonorm is a plain white paneled product with an aluminum extrusion uprights, nothing fancy or nothing interesting, just a wall which at the end of the day is pretty ugly. I decided that we would build our own backwall, make it custom and look neat. With all the grand ideas we had, I still had never built a booth, nor had any idea where to start. So I shopped around. I looked at booths at other tradeshows and decided a wooden booth with laminate on the outside would be good, Tan would be the color for a neutral background and graphics would be reusable. to help and off we went into the unknown, we built walls, labeled them, laminated them, preassembled and fixed any issues then assembled them for the final time. I have to be honest it did not look too terrible. After I totaled up my receipts it really looked a lot better, total expenditures WITH graphics was less than $4,500.00. We used that booth for 4 cycles for a total “Rental” of $1,125.00. I think that this is pretty cool that we saved over $55,500.00 for a wall that you would rent and give back 8 days later.